Articulate MOOC - Penny for your thoughts? As there are so many Articulate Storyline and other product users, wouldn't it be an option for Articulate to host a MOOC in addition to f2f conferences and events? Then everyone regardless of the country they live in. (i.e. New Zealand, UK, South Africa) would be able to participate and develop those skills that can be applied using Articulate products. Those users could then benefit from working with other members of the community and building up their skills and sharing their experiences of creating courses with Storyline etc. I think that many getting involved would surely benefit Articulate and all its user base. We already know that E-Learning Heroes Community members are interested in contributing towards learning. I just completed a MOOC through Adobe Education Exchange and found it very beneficial. I imagine it is a matter of how much can Articulate as a company ask of their people as it might add another layer to their structure. But, I think you have an excellent idea and would definitely go for it. It would be nice to have certifications or badges, etc. in trainings from Articulate. I think many of us would be glad to assist them with this project! 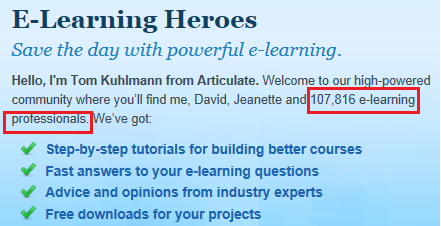 I feel it would be an addition to the great community Articulate have built up through the E-Learning Heroes forum. Of course it's up to Articulate to consider the potential for the MOOC. Great idea. I am not a fan of a big program like many MOOCs that require a lot of organization. I favor an informal approach where the community participates and we help each other. David posts the weekly challenges. We should take up a challenge and then solicit feedback. Or for those who are more creative and skilled, they could show how they did what they did. This seems more in line with community. And many in the community already share their source files. We just need to take it a step further. We don't need to wait for Articulate to create an "official" MOOC. Nicholas, I'd love to see what you and your colleague have drafted. Why not just start your own MOOC in a community thread? Set up a schedule and some ground rules. Then each week post the assignments in a new thread with discussions to follow. I'd participate. It was just a thought experiment. I have just completed a MOOC from UNi of Edinburgh called Elearning Digital Culture. It was 5 weeks in duration with 4 lecturers and one PhD research student organizing it. However, even though there were 20,000 signed up for the course - only about 10% completed the course. That is pretty standard apparently. The Uni are like many others, just trying MOOC out to see how and for what they could really maximize the platform for. "Bums on seats" tradition learners are reducing in numbers due to lack of funds and decreasing youth populations...so makes sense they explore other global options such as MOOC's. The organizers held weekly hangout groups so students could view it - which was basically a review and discussion of the weeks topics. Students could comment via twitter or youtube comment box in real time during the hangout.That part worked really well. I do believe that since this type of learning format can take a lot of time to structure and organise - I agree with Wendy in that I just do not see this happening within Articulate (right now at least!) - as I know Tom and David and others are extremely busy and this is very time consuming to set up and follow thru on. There would have to use a different group of folks to set it all up and oversee it. Anyways I believe the fact that so many folks drop off is due to lack of structure that keeps them in the learning game, it is free, too many options (blogs, twitter to follow, forums and more forums, hangouts, chat rooms..and then there is the content and recommended reading and viewing itself - phew), lack of personal interaction (student to student and facilitator with student). I see this as an business opportunity for perhaps some highly experienced Storyline users//trainers ..who want to use a MOOC as a distance learning tool - if it is based around Storyline then it would have to be webinar based for screen recordings and discussion. To be honest I think a more structured layout for learning Storyline and discussing elearning already exists on this website and through Storyline official training offerings, lynda.com and private ones also. But sure there is always room for another offering on a different platform to suit different learning styles. So bottom line I think a MOOC would work but it would have to be very well structured with a set number of students so interaction is high hence interest can be retained. I just can't see Articulate going down that road now..but it is a great idea for other elearning entrepreneurs/trainers to pick up on..
@Nicholas - thanks for getting the topic going..very interesting viewpoints! I find the way MOOCs have evolved to be not very helpful. Generally, there is a lecturer in a box talking at you and then you answer some questions or post something in a forum along with hundreds if not thousands of other learners. If you have a question or a point of debate with the instructor it gets lost in the crowd. I've tried taking a couple of MOOCs and could not get past the a couple of weeks. Some of the reports I've read that the completion rate on most MOOCs is around 7%. I would much rather read a book or research the topic myself. In that way I'm a self-directed learner. I would suggest that the forums and tutorials here are already a MOOC in the truest sense of the word. MOOCs grew out of the Connectivist Learning theory of George Siemens and Stephen Downes. If I have a question I can post it here or look in tutorials and usually get an answer. I can discuss the best way to do something or get inspiration. Heck, there are even weekly challenges. "Hi All I have just completed a MOOC from UNi of Edinburgh called El..."